This recipe is similar to the One of the classic recipe of my home town Karnataka Ottu Shavige (Pressed homemade rice noodles)/Shemige/Akki shavige. I never had the Shavige Maker to make it fresh so tried with wheat thin noodles. Now boil water in a sauce pan and soak noodles for 3-5minutes until soften. Drain and set aside. Now heat olive spread in a pan and roast raisins, nuts until golden- remove to plate and set aside. In the same pan add ground dates-coconut paste and saute for 2-3minutes. Add coconut milk-give a good stir, bring the mixture to boil and let it simmer for 4-5minutes. Turn off the flame and stir in cardamom powder. 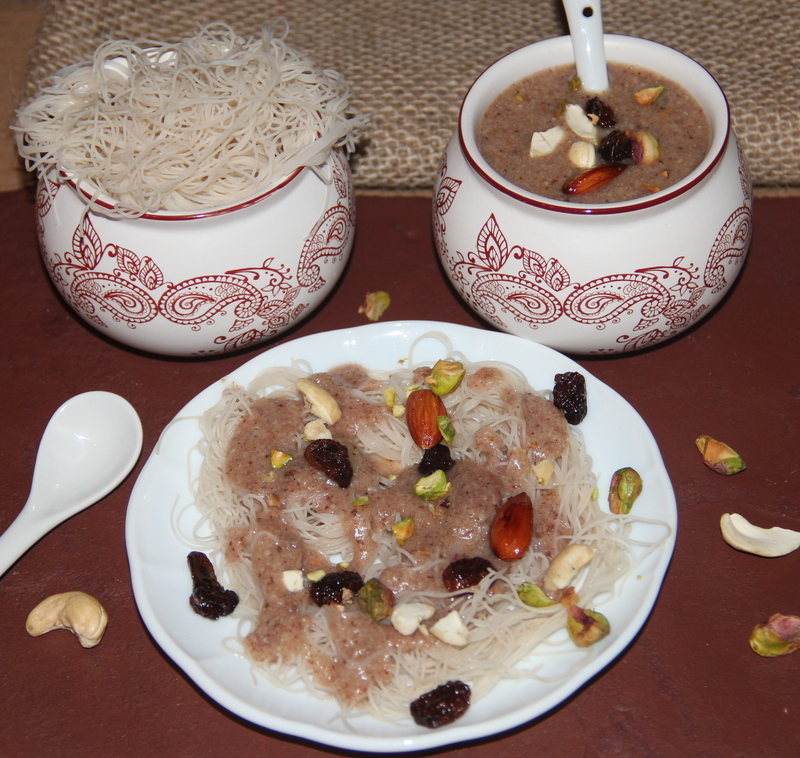 Place cooked noodles in a plate-top with a small cup of dates coconut syrup, garnish with roasted nuts, raisins and serve. I used wheat thin noodles so haven’t roasted before cooking. Dates gives natural sweetness but sugar/Jaggery can also be used. Posted on February 24, 2015, in Indian, Sweets. Bookmark the permalink. 12 Comments. I love dates and love how this dish is sweetened naturally with the dates. It sounds so good, coconut, dates, nuts, cardamom. Really sounds wonderful Chitra. so would this be considered a main dish or snack? Intriguing combination of flavors and textures! Something looks different here at your site…new background, perhaps? It looks very nice! Your dishes always look so festive and inviting. They look as if you are taking a culinary adventure. You are so talented at this! Thanks Chitra!